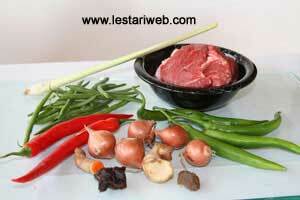 Here it is the typical cuisine from Banjarmasin - South Kalimantan : Sour Beef Soup. I think it tastes similarly to the Bone Ribs Soup from Palembang - South Sumatra. Tempting flavours of spices & fresh vegetable definitely stimulate you to try this! . Pour in 1.5 liter water in a deep saucepan, cover the pan and bring to boil. 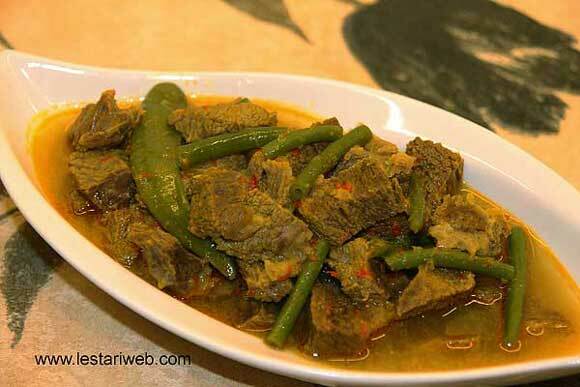 Adjust the heat into medium, *** add the beef meat until cooked. (If necessary skim off and discard the fat that floats to the water surface). Take out the meat and cut into a cube (2x2 cm). Put again into the pan. Wash and cut the long/french beans into 3 cm length. Put aside. Put all ingredients for the paste in a blender or food processor and blend until smooth. If necessery add a little bit oil to help the blending process. Heat 2 tbsp oil in a Wok or big saucepan. (Don't add oil if already added in a blender). Stir fry the paste & lemon grass. Stirring all the time until fragrant. Add the fried spice into the pan. Add the sliced beans & big green chillies & continue cooking until vegetable half cooked. Adjust the seasoning, add the salt and sugar to taste until it tastes sour & sweet. Serve hot with rice. *** Add the meat into boiled water then cook on the medium heat to preserve it's best taste.